Over the years, I’ve made Thanksgiving more about homemade, from scratch dishes and less about anything that’s pre-prepared. And, during that time, I’ve also spent less and less time with my family on Thanksgiving and more and more time in the kitchen. Well this year, that ends. My goal for this Thanksgiving is to spend as little time in the kitchen as possible and still have that wonderful traditional turkey dinner. I’m going to utilize the frozen and dairy aisles as much as I can for this Thanksgiving. There’s so many little timesavers available. For instance, those incredible pies. My family’s favorite are Mrs. Smith’s Dutch Apple and Sweet Potato Pies. 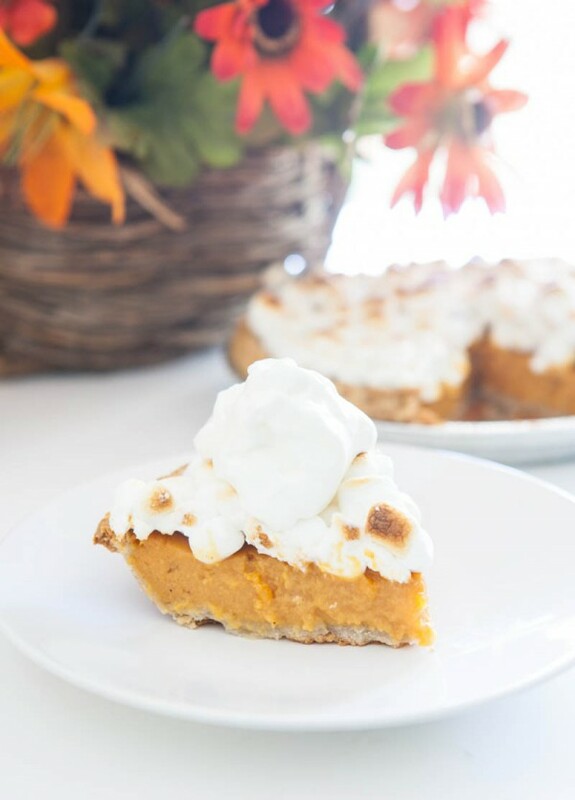 Here, I have made a few little additions to a basic Mrs. Smith’s sweet potato pie to make it even more special! After the pie was baked, I added mini marshmallows on top and quickly put it under the broiler, just until the marshmallows were browned. Then, when I serve it, I add fresh whipped cream (but to save time, you can also buy whipped cream topping from the dairy or frozen food aisle). It’s such a simple and easy dessert that everyone loves! And, what I really love about this dessert is that I don’t feel that I have to make a sweet potato side dish if I serve this pie. Win, win! Make an easy to follow menu plan filled with easy, time tested recipes paired with pre-prepared menu items you can find in your grocer’s freezer and/or dairy aisle. Choose one or two pre-prepared pies available in your grocer’s freezer for Thanksgiving Day dessert. There’s a huge variety of delicious, just as good as homemade pies available that your guests will love. Yeast rolls are a very popular Thanksgiving side. Instead of making your own from scratch, choose a frozen pre-prepared yeast roll from the freezer aisle. Don’t forget to look at the pre-prepared sides available in the freezer aisle. There are mac and cheese dishes and scalloped potato family-size sides that would work great for Thanksgiving. Don’t forget to also stock up on basic frozen vegetables for recipes like green beans, spinach and peas. These ready-to-go items will save a lot of time in the kitchen. Be sure not to forget the whipped cream and ice cream! These ingredients are perfect pairings for Thanksgiving Day pies. Make ahead as many recipes as you can the night before Thanksgiving and refrigerate until those dishes are ready to go in the oven. Keep the appetizer tray light and healthy. I like to serve lots of fresh-cut veggies and a few assorted cheeses— you don’t want your guests to fill up before dinner is served. To cut down on the amount of dishes, use disposable baking dishes. You could also look into paper plates. There’s a huge variety available online and at your local party store and some of them are really beautiful. Be sure to have lots of disposable storage containers on hand so that you can send leftovers home for guests. This will cut down on the amount of food you have to store in your fridge. Bake Mrs.'s Smith's Pie according to package directions. Let cool completely. In a medium bowl add whipping cream and beat with an electric mixer on high until cream is light and fluffy. Add sugar and pumpkin pie spice and whip until well combined. Set aside. Preheat broiler. 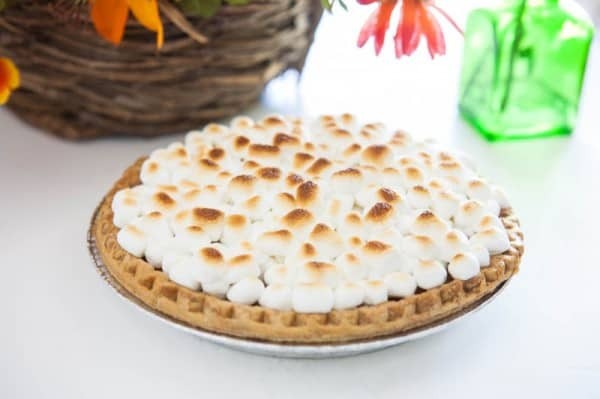 Add marshmallows to cooled pie and place in a oven for just a minute or two, or until marshmallows are browned and melty. Serve topped with spiced whipped cream. Easy is my middle name! As long as it doesn’t compromise on taste, I’m in. This sounds awesome! I love that you took a pre-made pie and jazzed it up! Simple and easy…my kinda recipe for this time of year. Nothing wrong with taking a shortcut or two – especially around the holidays! No one will care whether it’s homemade or frozen when it looks this good! Great tips! That’s why convenience items are out there – we should definitely take advantage. I would like to start with a slice of this tempting pie, please. Very smart idea Angie! Why not dress up a good dessert that is already prepared! Great idea! It’s like the coveted casserole and a dessert rolled into one. Nice “doctoring” of a frozen pie. You’re so smart to use these tiny tricks to make your holidays easier. You deserve it, especially since you’re in charge of the kitchen! 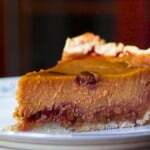 I’ve never actually had a sweet potato pie but yours looks like what I’d picture! That sort of picture perfect pie. Love! Easy? What’s that? lol! I need to incorporate more easy dishes into my life, you have the right thinking! What fantastic tips for hosting Thanksgiving! And I totally agree about keeping the appetizer light and easy. That looks amazing! Great idea to fancy up a frozen pie! 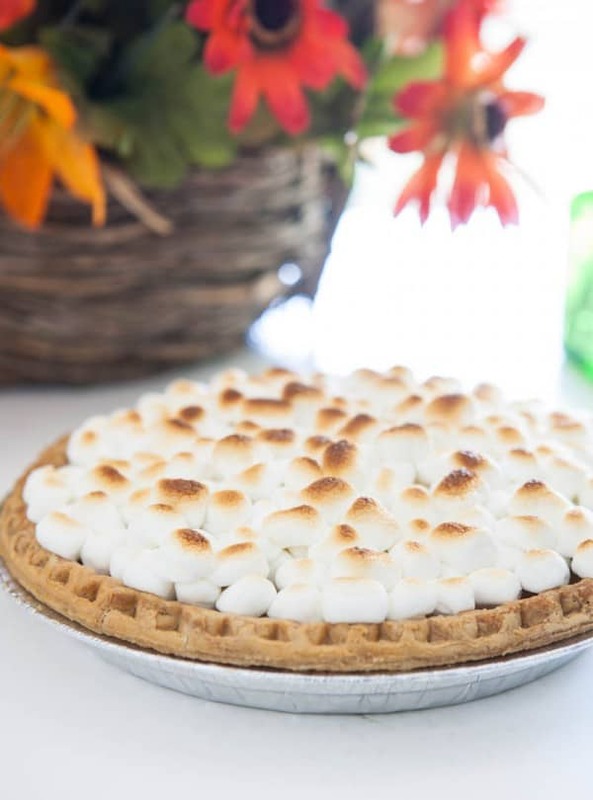 I love how you put your own spin on this pie – it looks fabulous! Great tips to remember for the holiday! Love this recipe… love the spiced cream topping. Thanks for sharing!